...before everyone hears about it. (SPOT.ph) How do you make a top tourism destination even better? 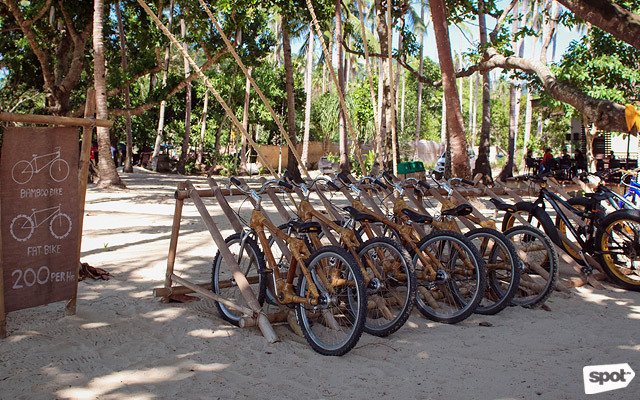 As the Lio Tourism Estate in El Nido, Palawan, nears completion, discover the answer. 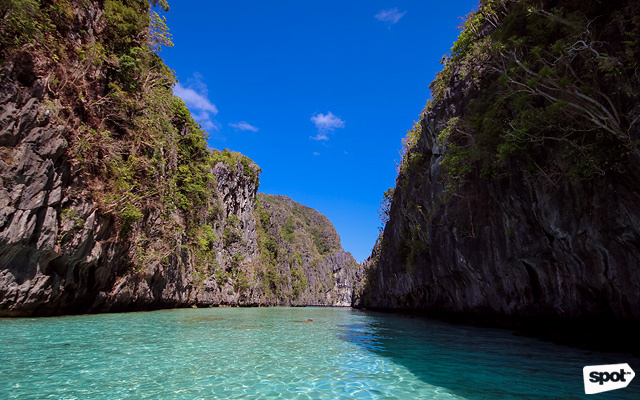 El Nido is famous for many things—beautiful white-sand beaches, gorgeous hidden coves and lagoons, excellent snorkeling and dive sites, and majestic limestone cliffs are just a few of them. What no one ever raves about, though, is the town proper, Poblacion to the locals. As Palawan’s popularity has sky-rocketed in recent years, so has its population, and the town center—home to numerous small hotels, bars, and souvenir shops—now seems cramped and chaotic. But things are about to change on the island, in a big way. 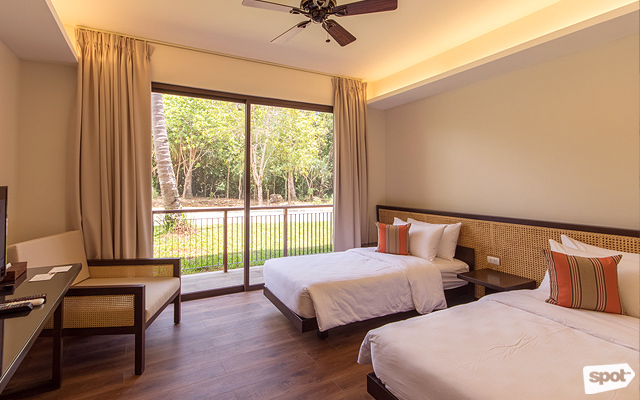 With Lio Tourism Estate, which opened its doors to the public last March, Ayala Land has created El Nido’s first integrated resort community, a fully master-planned township with hotels, restaurants, commercial spaces, an artists’ village, sports facilities, and, for guests who’d like to make their stay in the island permanent, residential communities. 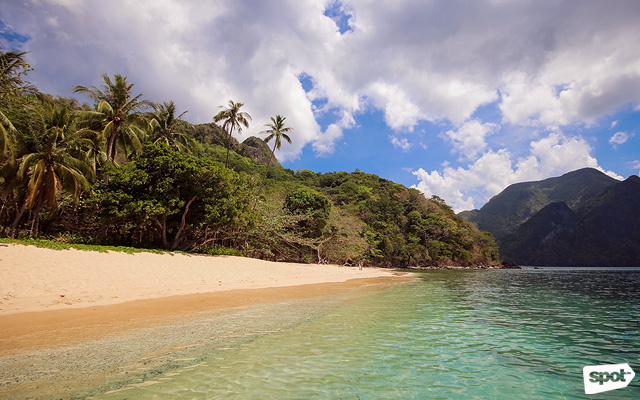 The sprawling 325-hectare tourism estate—calling it a resort doesn’t really do it justice—gets its name from the Cuyonon word "lio," which means “the other side,” which is how the El Nido locals used to describe this part of the island. In reality, it’s not that far away, only about 10 or 15 minutes by van or tricycle from Poblacion. From Manila, getting to Lio couldn’t be easier: it’s only a 55-minute plane ride away (via AirSwift), and once you land at Lio Airport, it's around a five-minute drive to your hotel. Just follow the island’s main highway and make a left at Kalye Kalipay, which means “the road to happiness.” Pretty soon, though, that journey is going to get even shorter when the new airport terminal opens; it literally is a stone’s throw away. The estate houses three hotels, each designed with a particular type of traveler in mind. 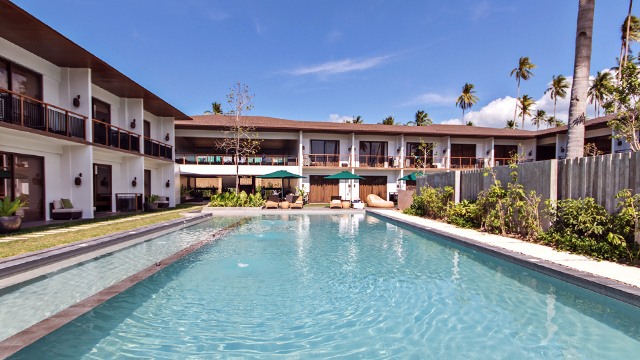 The first one to open was Casa Kalaw, which welcomed its first guests in March. Named after the large horn-billed bird common to these parts of Palawan, Casa Kalaw was built with families and balikbayan tourists in mind. With interiors designed by VBo Architects + Engineers, the 42-room two-story complex is built around a relaxing pool. 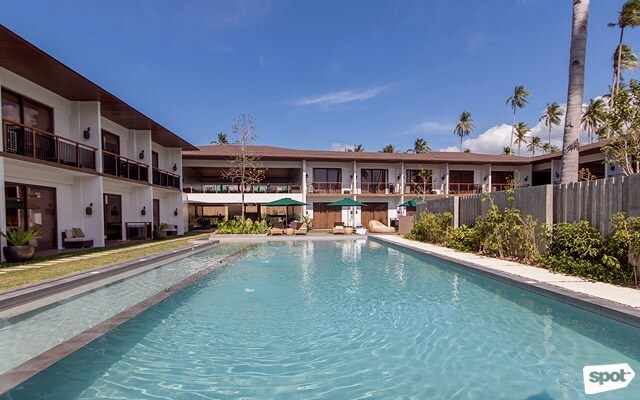 Slated to open this June are the other two hotels: Hotel Covo, a 20-room complex designed by architect Ed Calma with interiors by Edwin Uy; and Balai Adlao, a 20-room hotel designed by architect Conrad Onglao. The former will cater to the young, backpacking tourist, while the latter is billed as a more romantic type of lodging for honeymooners and couples. 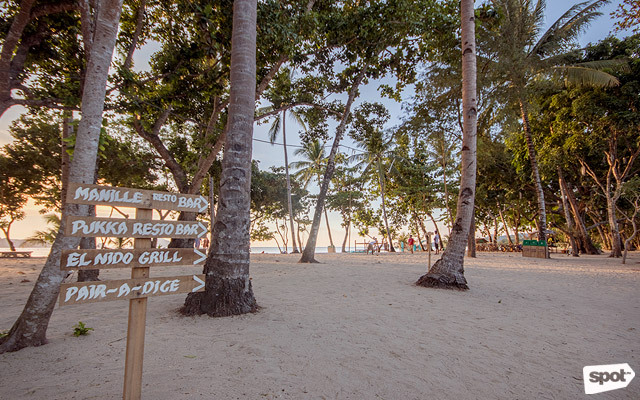 Unlike the hotels and hostels that crowd the town proper, Lio Tourism Estate offers its guests a proper beach front with fine, powdery sand, gently breaking waves, and soaring coconut trees to get you into vacation mode. 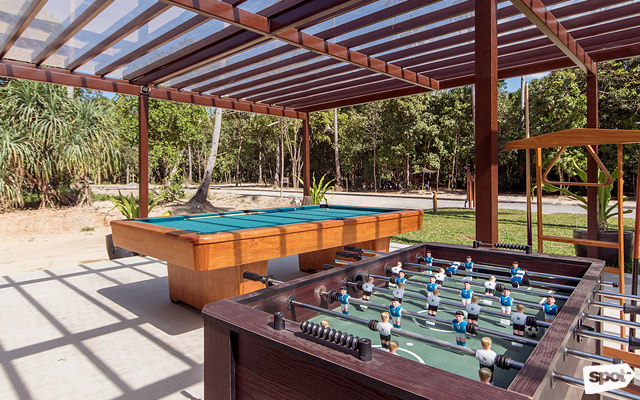 If you don’t feel like swimming, you can rent a bike to explore the property, go kayaking or paddle boarding, or play beach football and volleyball under the shady trees. On one end of the beach, a jetty has been built so guests don’t have to visit town to rent a boat. 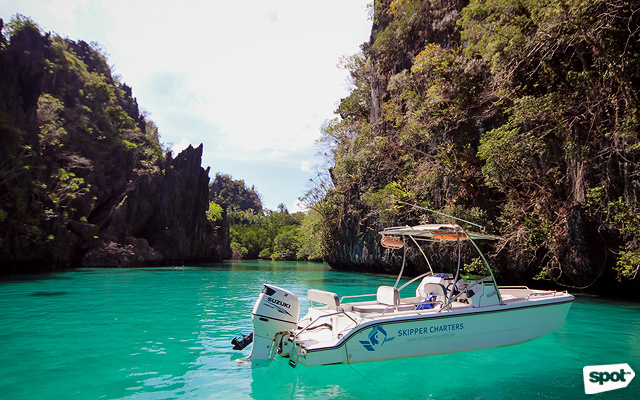 In El Nido, island-hopping is a must and we highly recommend Skipper Charters (info@skippercharters.ph, 0917-833-6063) if you want to do it in style. 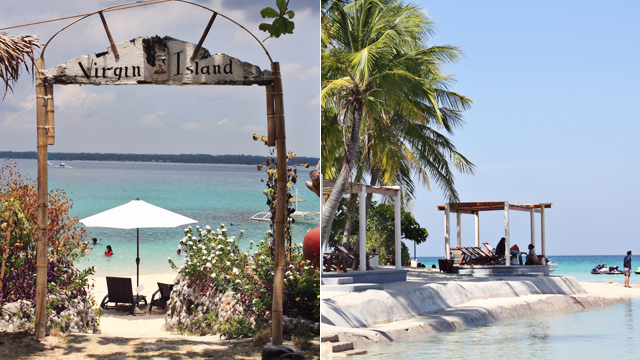 They take you around the islands in speed boats instead of the usual bangka packed with dozens of other tourists, so you and your friends can spend more time in the hidden lagoons or isolated coves instead of chugging along slowly in the open sea. Palawan has been selected numerous times as the best island in the world—but that’s a little misleading. Palawan itself is made up of hundreds of islands and Bacuit Bay, where El Nido is, has 45 of them, so there is so much to see and explore. There are some pretty impressive snorkeling sites, too, so do ask your boat’s crew to take you there. 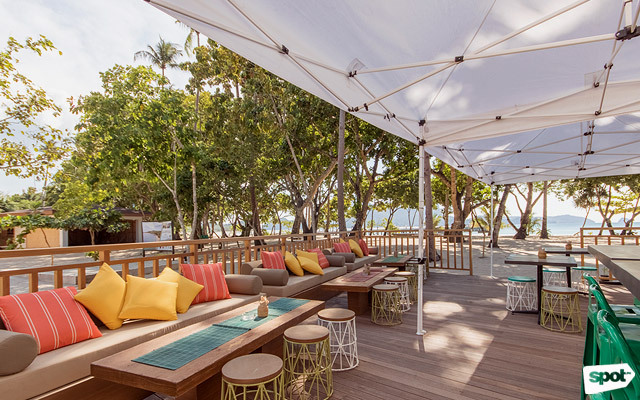 Once you make it back on to dry land, you’ll surely have worked up an appetite—thankfully Lio has plenty to offer hungry—and thirsty—guests. 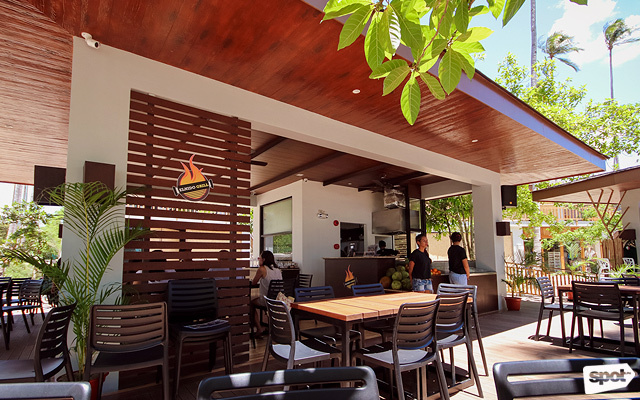 If you’re too lazy to leave the hotel, you can lounge at Kalaw Café and Bar (it’s also where you’ll likely have your breakfast). As the restaurants are all nearby, however, there’s no excuse not to try other things, including the specialty hamburgers of Pair-a-Dice Burger Bar, the craft cocktails at Manille Beach Bar by Destileria Limtuaco, international cuisine from the appropriately named Globy Travelling Chef Restaurant, and grilled seafood and other treats from El Nido Grill. 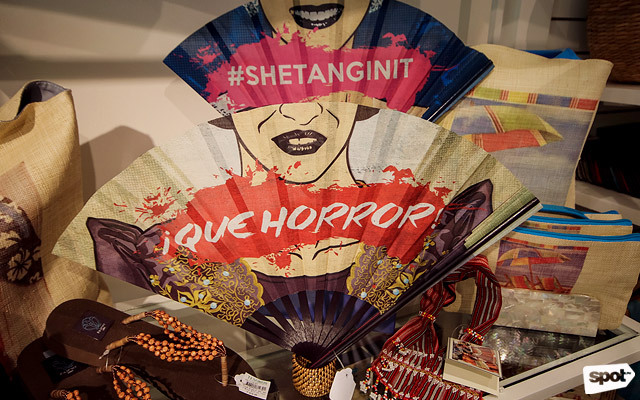 While majority of the shops are run by locals, there are a handful that are quite well-known, including Tesoros—its Lio iteration is named Cabaña. 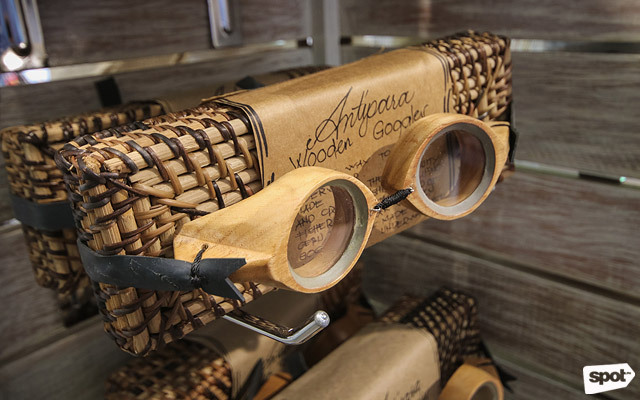 “We are committed to create a store that will represent the best of Philippine-made native crafts and new craftsmanship that will appeal to Filipinos and foreigners alike,” says Maria Isabel Tesoro, the company’s CEO. 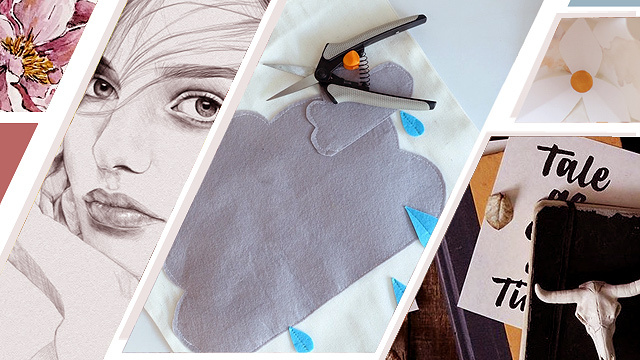 With over 10,000 items in the group’s total inventory, the number of products in the Lio shop had to be whittled down to suit the location and market. “We didn’t want it to be just a souvenir store, we want it to be a memento store of your experience of Palawan,” she continues. On offer are the men’s resort line with hand embroidered details, ladies' rayon and cotton beach wear, the exclusive Tesoros collaboration with Anya Lim of Anthill, the eye-catching fans by Monchet Olives, men’s and ladies’ hats, and snacks. 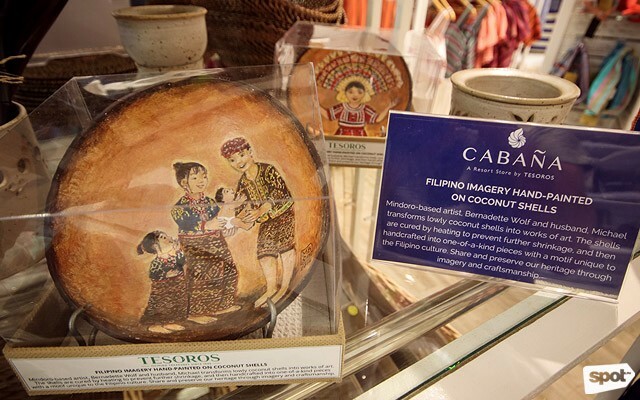 Other souvenir and gift items span the gamut of price points, from crocheted knick-knacks and Cagayan de Oro stoneware to the fancy mother-of-pearl caviar spoons and inabel fabric from Ilocos. 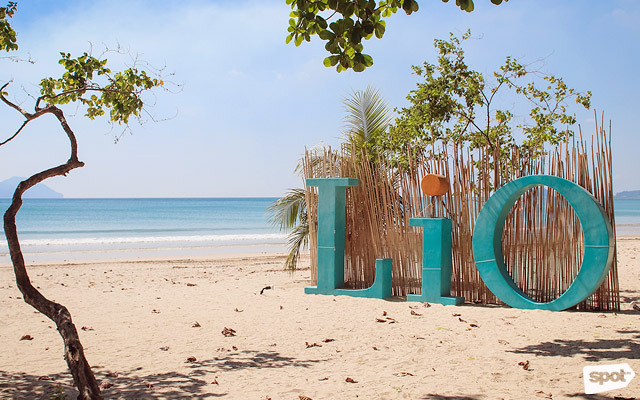 Lio Tourism Estate is managed by Ten Knots, the same group that runs the award-winning resorts on the Palawan islands of Lagen, Miniloc, Pangulasian, and Apulit. 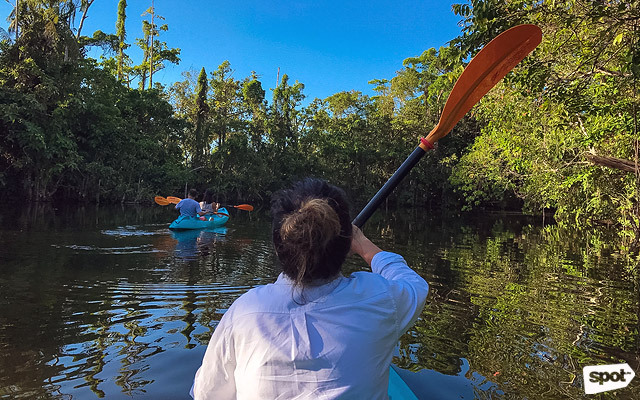 As such, it follows the same principles, what’s called the “quadruple bottom line,” ensuring sustainability in four aspects: the environment, the community, the people, and economic development, according to Ten Knots marketing associate Nadine Gutierrez. 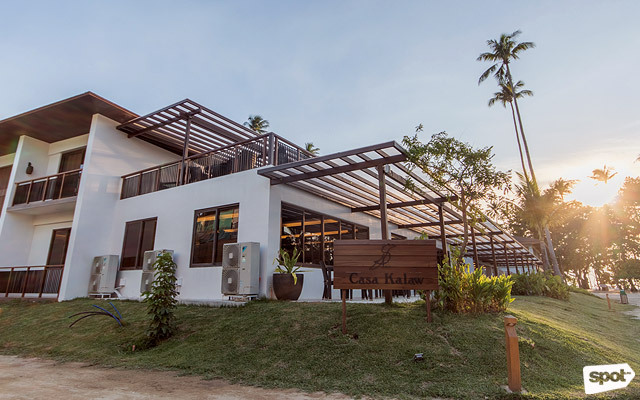 One big difference between Lio and the other Ten Knots properties is that this one is open to the public—anyone can enter the complex and enjoy dining in the restaurants, shopping in the retail stores, or just spending the day at the beach. Could it be the next big thing? Maybe. This June, a major musical festival from the same group behind the successful Malasimbo music fest is taking place. Be among the first to say you were there. 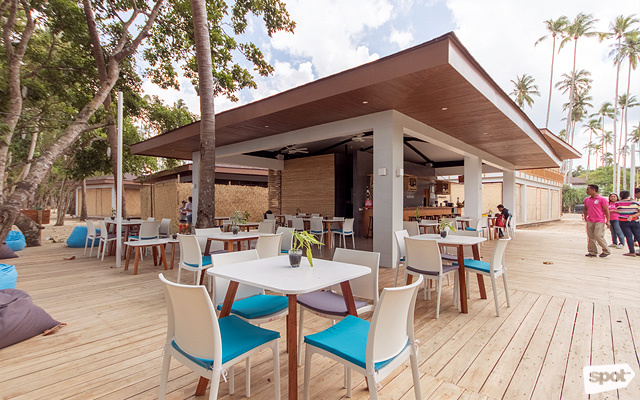 A quick tour through some of the restaurants that line Lio's beachfront. 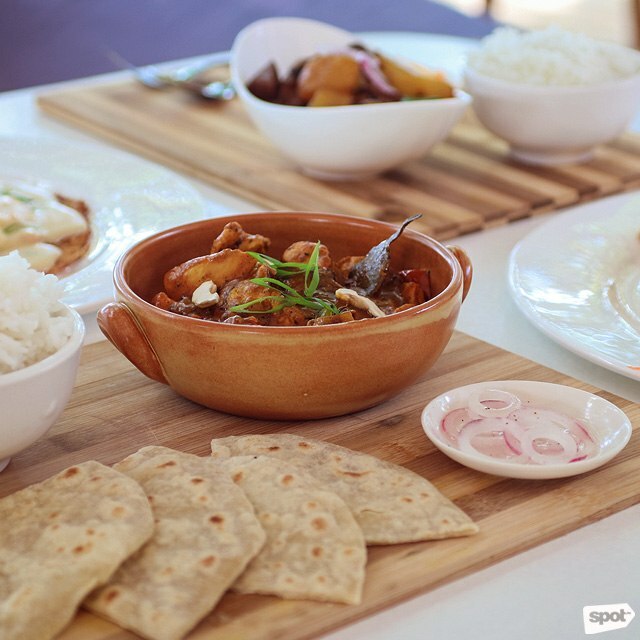 The El Nido outpost of Boracay’s Globy Traveling Chef serves the same familiar mix of international dishes along with Filipino favorites, all listed on a menu that could make anyone want to order way more than planned. (You’ve been warned.) 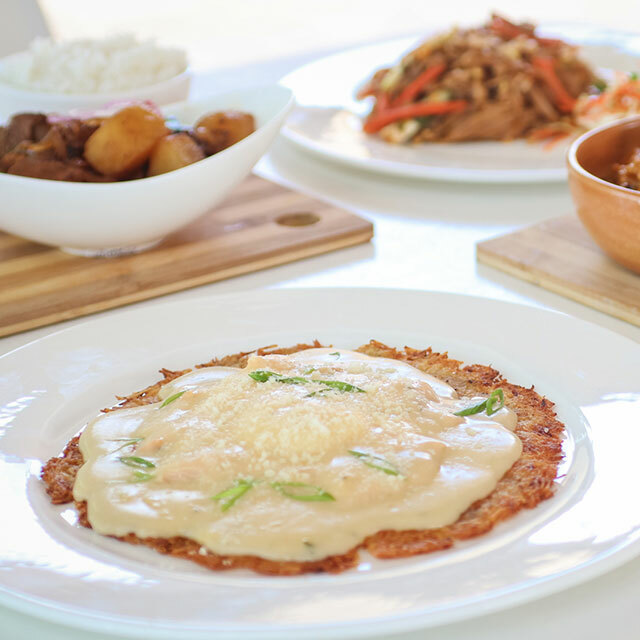 Ask manager Remy Nisola, and she’d happily suggest the chef’s own Globy’s Breakfast (P350), a satisfying combination of potato pancake punctuated by the brininess of smoked salmon and a runny poached egg and creamy cheese sauce. If you’re in the mood for something bold, go for the Chicken Tikka Masala (P450) with its comfortingly warm chapatti and bold, mildly spicy curry. There are 10 different burgers on the menu, but if co-owner Dominick Fresina had his way, there would be even more. “I had to fit them all into a one-page menu,” he says, slightly disappointed that his other creations had to be put on hold. Dominick hails from Texas, and as they say, everything is bigger in Texas, so expect the burgers to be hefty and juicy. The Bacon and Cheese Pleaser (P390) is among the most basic choices here, but it lives up to its name—you can’t go wrong with lots of bacon and melted cheese. The Tokyo Teriyaki (P390) has an interesting mix of flavors provided by the contrast of sweet grilled pineapple rings with teriyaki sauce. 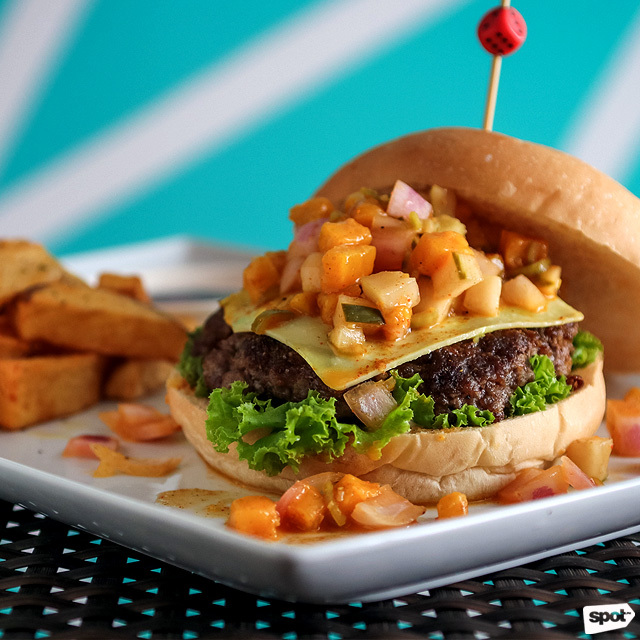 Another Asian-inspired burger is The Blazin’ Asian (P390), which should please fans of Indian food. The burger gets its pronounced flavors from loads of coriander leaves, cumin, curry powder, and cayenne peppers. 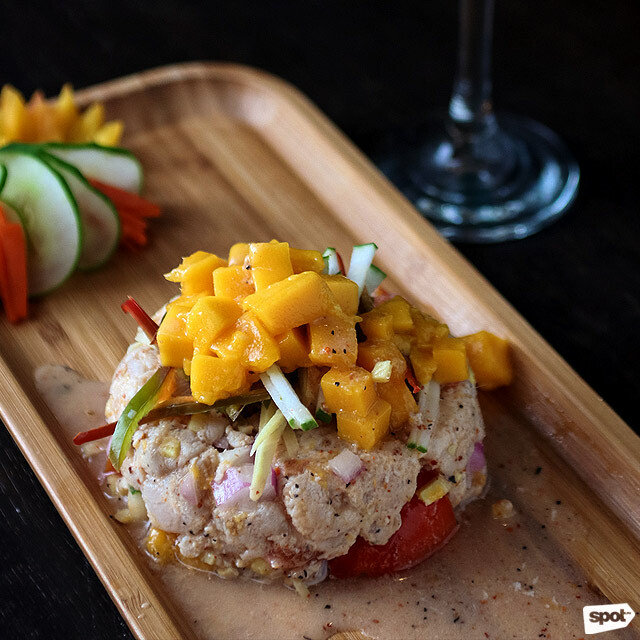 A mango salsa, perhaps a nod to mango chutney, completes the dish. 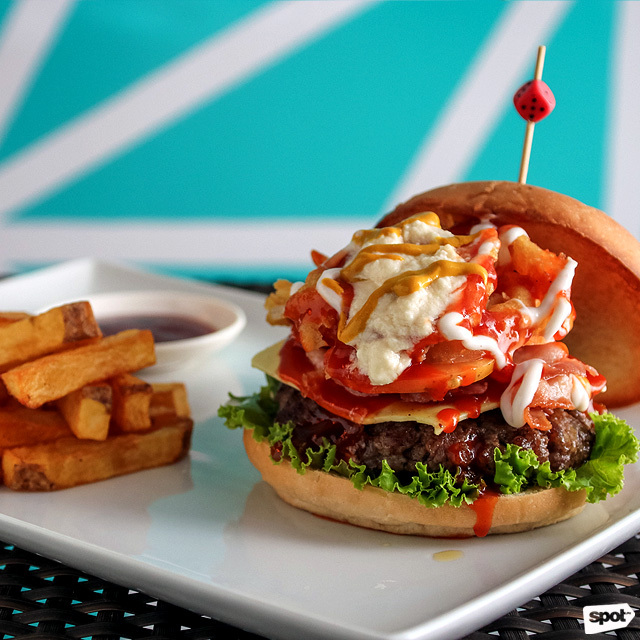 The sandwich that shares its name with the establishment, the Pair-a-dice Burger (P450), has everything going for it: bacon, fried onions, pepper jack cheese, sour cream, and barbecue sauce. For many of us, a trip to the beach isn’t quite complete without indulging in grilled food, which always hits the spot. Owner James Aquino calls his food “basic,” but simple yet good might describe it better. 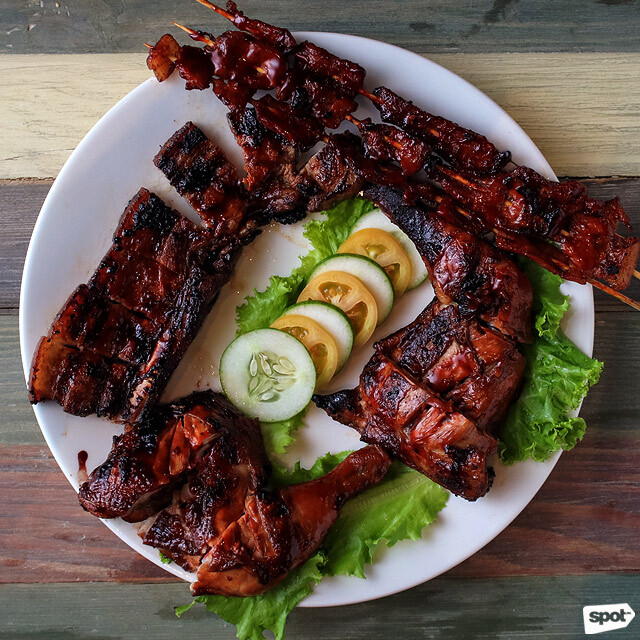 The Liempo (starts at P320) is the hands-down best-seller here, and you can’t argue with the smoky flavors and juicy roasted pork. 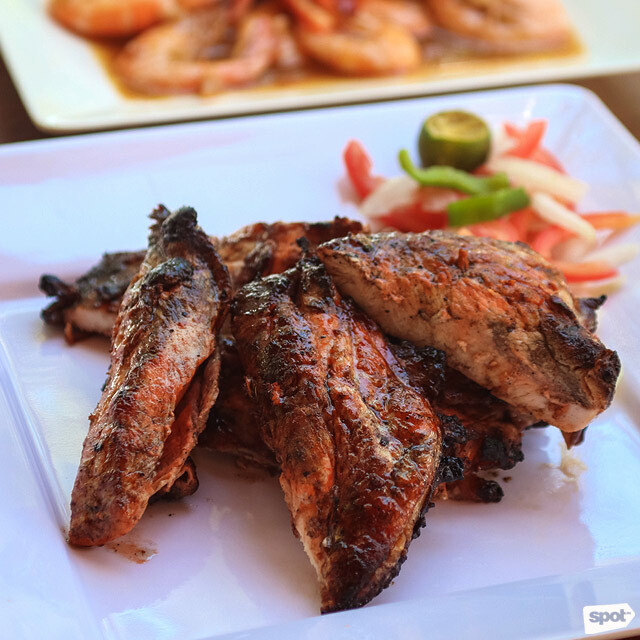 Besides the other grilled specialties, which include squid (starts at P370), mussels (P220), fish (starts at P480), and chicken (starts at P340), El Nido Grill offers excellent ginataan dishes. 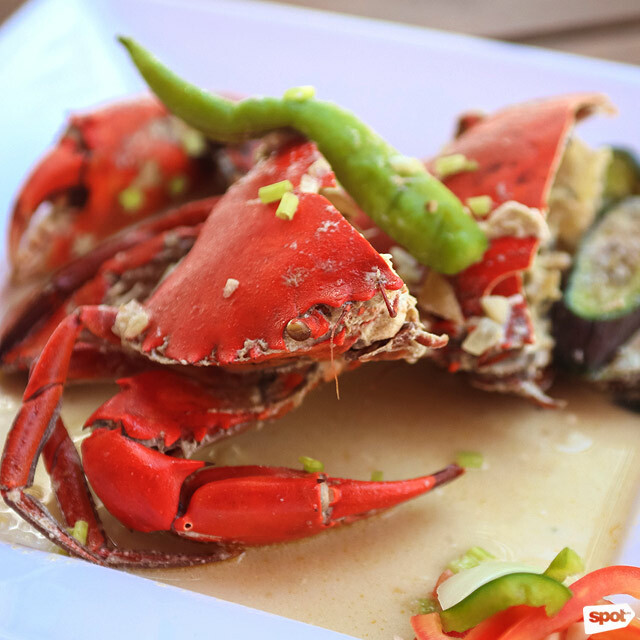 The crabs (P580) cooked with coconut milk develop another level of sweetness, you won’t mind getting your hands all greasy getting to the good bits. An off-the-menu item which the owner himself sometimes prepares for guests is shrimp cooked in aligue (crab fat). You can diet or detox when you get back home. 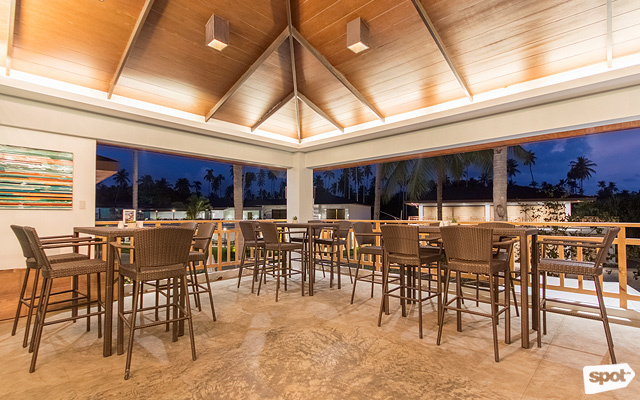 As the sun sets, head over to this bar for dinner and drinks backed with live musical entertainment. 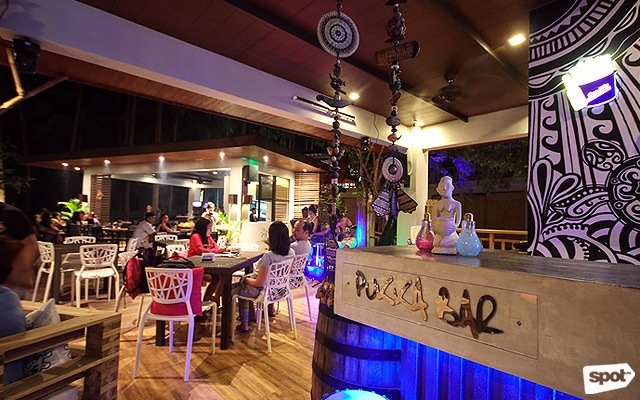 Maybe because this is where big groups will gather at the end of the day, the menu is a mix of different cuisines; there’ll be something for everyone, from steaks (rib-eye, P750) and ribs (P300) to pasta and Mexican (with a twist, as the menu says, so don’t expect 100 percent authenticity). If you’re having a beer, pair that with either the Kinilaw (P230), Calamares (P200), or Pork Sisig (P200). If you start to feel guilty, there’s also lighter fare that includes Tuna Salad (P150), Fish Tacos (P200), and the Fajita Veggie (P180). 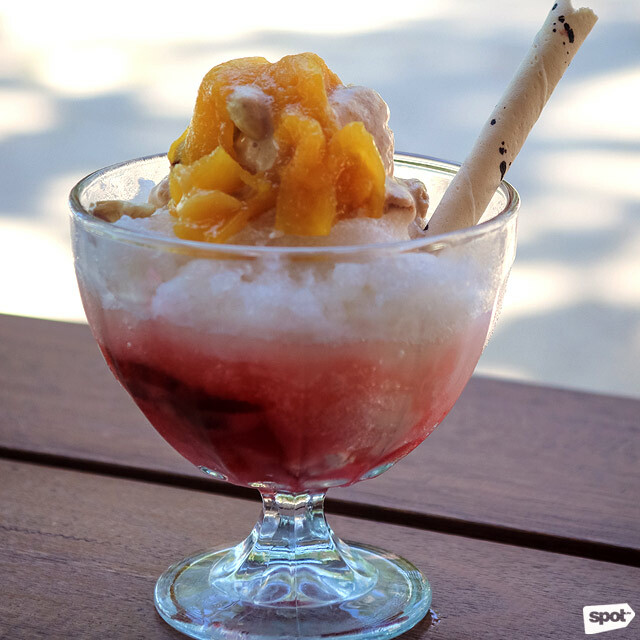 Pukka’s signature dessert is the Banana Split (P200)—sinfully sweet caramelized bananas served with lots of cream and ice cream. The star of the show here is their wood-fired brick oven, which we’re told only takes three minutes to cook perfect pizza. Like most classic Italian restaurants, the menu is concise but mouthwatering—when a place chooses to specialize in one thing and one thing only, you know you’re in for something good. 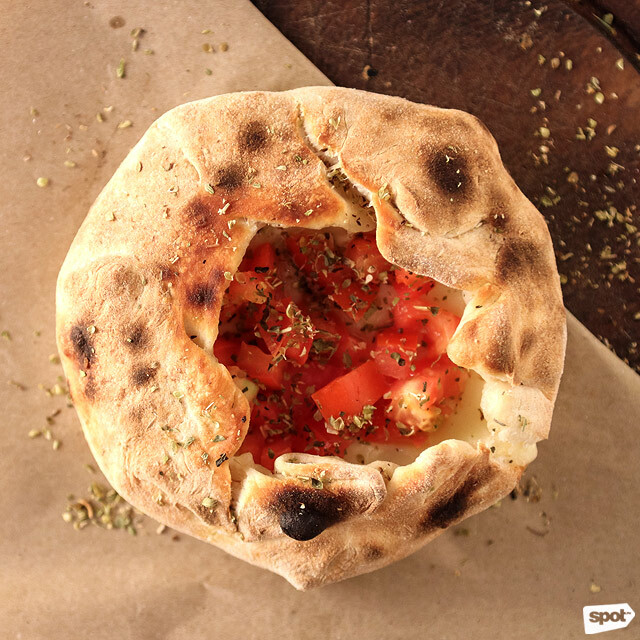 Try the Provolone (P500) to start, and savor the warm, chewy pizza dough stuffed with provola cheese with the freshness of tomato and oregano. 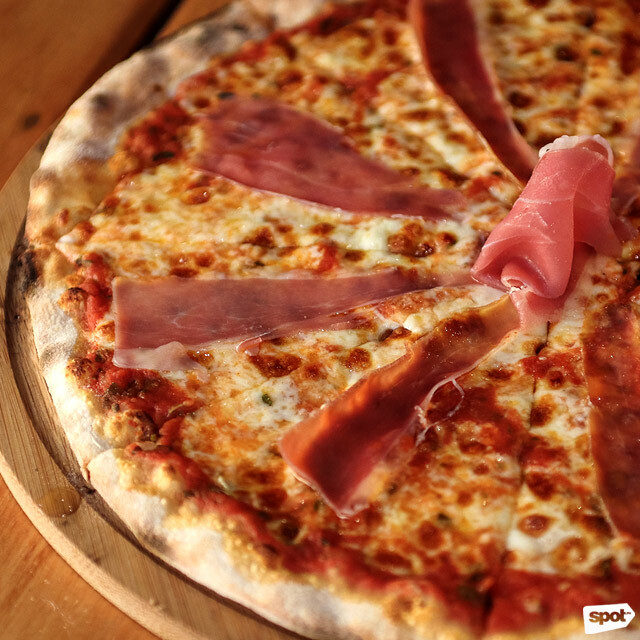 If you just want a pizza, you can’t go wrong with the Crudo (P500), which flaunts Parma ham on a straightforward tomato-and-cheese base. Think of this bar as a showcase for the famous distillery’s best-selling products, although they serve really good food here too. Behind the bar are some talented mixologists—if you’re lucky it’ll be Larry Guevara who’ll be doing the pouring, telling you the stories behind his concoctions. 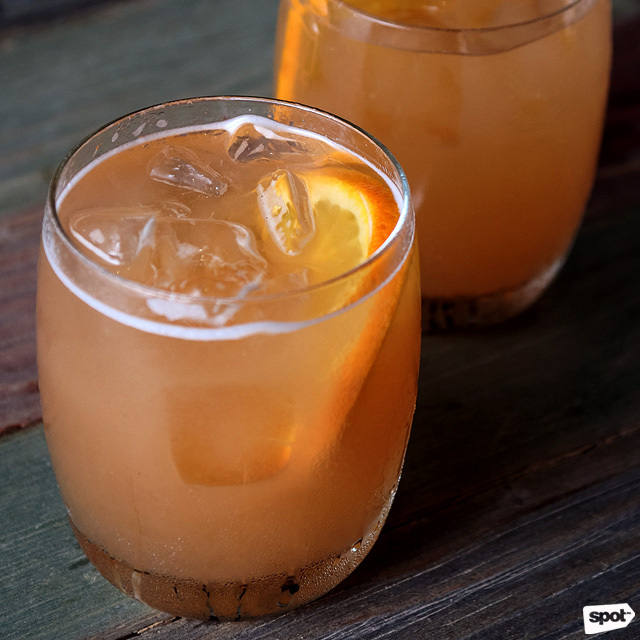 A favorite is Yuzu Good To Me (P280), a simple, slightly sweet and citrusy cocktail made with El Hombre Silver tequila, Campari, and yuzu. 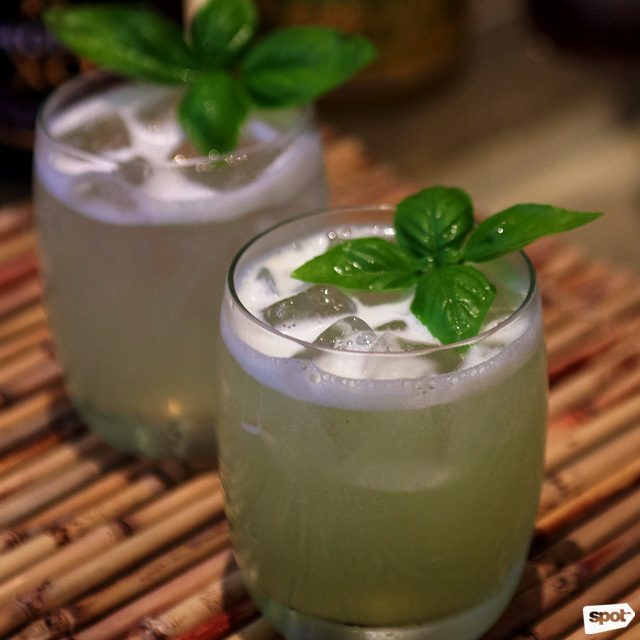 Even non-drinkers will become converts with the Calauit Park Swizzle (P230), an easy-to-down drink made from Old Captain five-year-old rum, orgeat syrup, and guava juice. Mojito fans would love the incredibly refreshing Manille Basil Smash (P250). If his fiancée Sharleen is around, they might even show off their cocktail mixing skills—watch in awe as she acrobatically pours four cocktails while Larry holds her up.